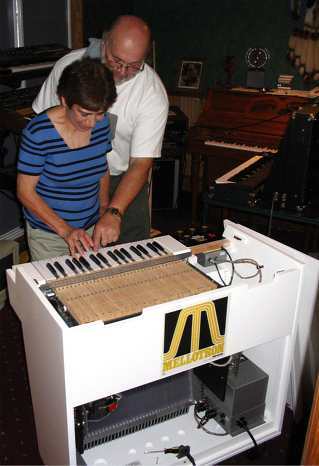 Dave Schwartz was anxious to get his Mellotron. You have to understand that he'd never played it. Heck---he'd never seen it! 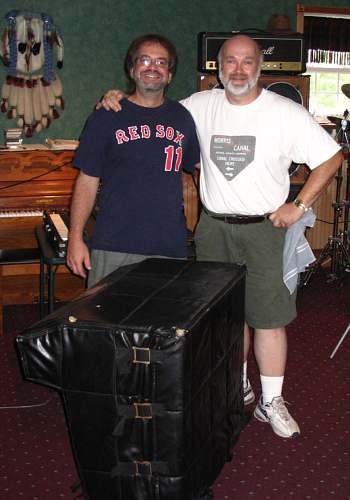 Bernie Kornowicz arranged the deal, and the machine went right to Vermont along with Bernie's. 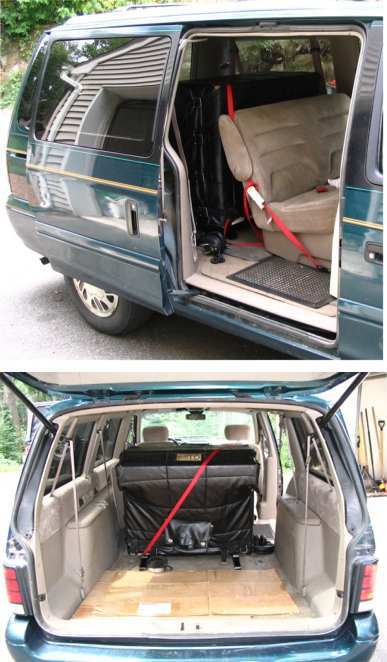 We got the 'tron out of the van and downstairs to the music room--with the machine still in its Protect-O-Muff. It wasn't time for the unveiling yet! That was around 10:30am, and the real unveiling wasn't until our BBQ was in full swing...several (agonizing) hours away, huh, Dave? :-) We sent Dave out of the room, and Peg promised to keep him busy while Jerry "unveiled" the 'tron for the camera and made sure any last minute adjustments were done. Although Dave doesn't play so much in his basement these days (practice sessions are down the street), there's still enough equipment there to make noise, and certainly enough for the M400 to be happy. Dave usually plays drums or guitar. This is the Mellotron's new home. 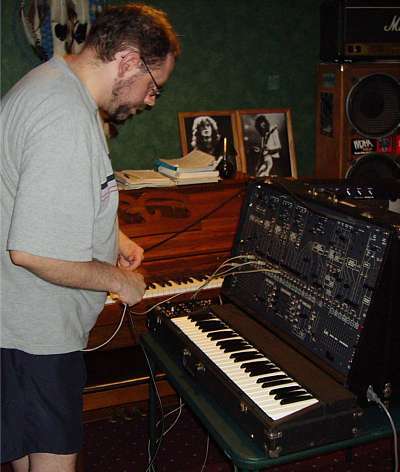 Dave has a PolySix (which he spotted discarded on the curb) and a Prophet 5 (the Prophet 5 was purchased from the "Cats" musical on Broadway). 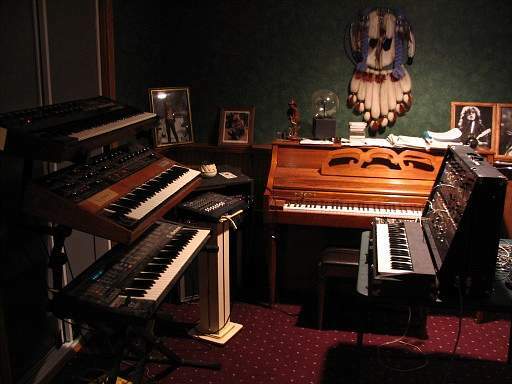 Unfortunately these instruments aren't in the best of shape, although they do make sound. 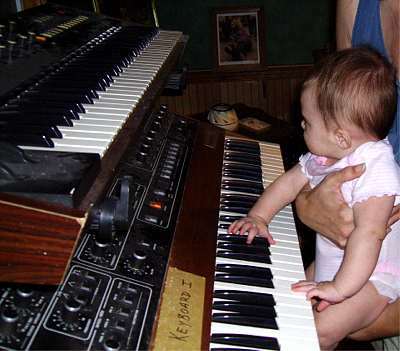 The Prophet 5 is probably a Rev. 2, nice and "phat". The PolySix--when it works--sounds like a...ummm...PolySix. Gotta get them fixed up, Dave! 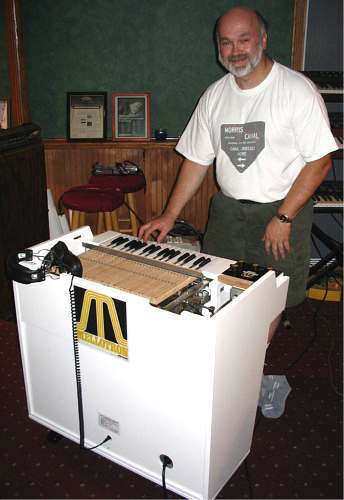 And there's a Matrix 6 keyboard as well, on which Dave used to make his imitation 'tron violin sound. 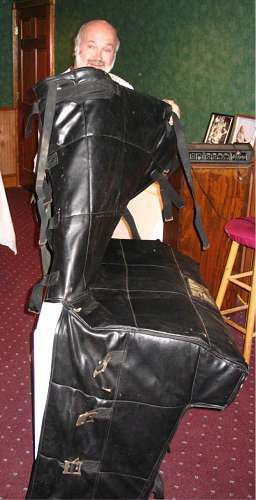 ...and a set of drums. 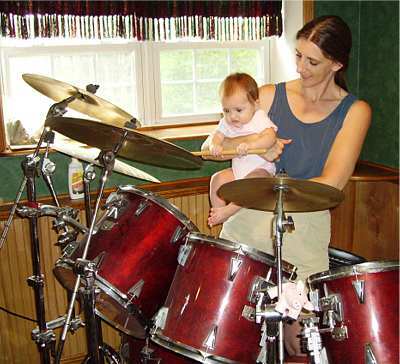 I'm not sure which instrument little Evie will wind up playing. Perhaps all of them? 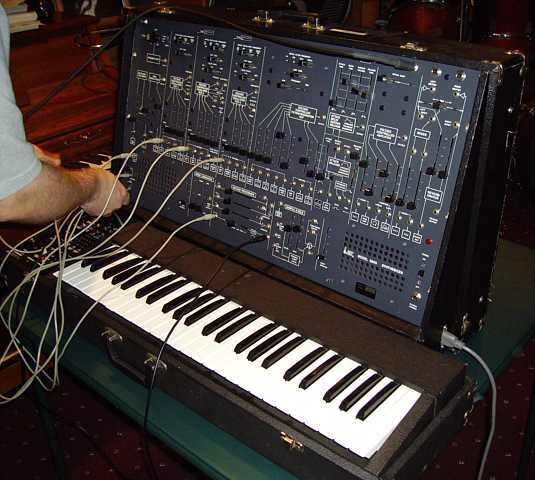 The ARP 2600 in the picture, "The Problem Child", is Your Webmaster's, just picked up from the repair shop. "Where the hell does this one go...?"